“No wire hangers, ever!” Faye Dunaway once screeched in her now infamous role as the monstrous Joan Crawford in the movie Mommy Dearest. 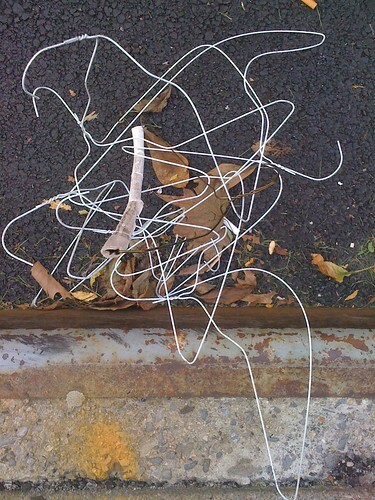 While dry cleaning businesses are a critical part of any community, particularly in urban areas, the amount of waste generated by all those cheap, wire hangers is clearly a disposal problem. O. A. North of Connecticut is credited with creating the first metal hanger back in 1869. Since then, the metal hanger’s popularity has slowly grown into an indispensible part of the dry cleaning industry although some plastic hangers are used as well. In line with Ms. Crawford’s less than cordial recommendation, most consumers are quick to get their precious garments off those shoulder destroying wires as soon as they get home and onto hangers made of wood, sturdy plastic or cloth! Considering that the average woman spends $1500 per year on average on dry cleaning according to Procter & Gamble, that adds up to one huge pile of discarded metal hangers on an annual basis! Think of it this way, if the typical garment costs $3-5 to dry clean, each woman in the United States would discard approximately 375 cheap metal hangers each year into the trash! Approximately 90% of metal hangers fail to get recycled likely because most municipal waste programs do not accept them as part of the community recycling program. The track record for recycling cheap plastic hangers is not much better as the typical plastic hanger is made with a mix of plastic resins which make recycling very difficult. So what to do if one wants to make the dry cleaning experience completely green from the chemicals used to the recycling of the hangers at home? The easiest way to deal with the pile of dry cleaning hangers is to simply return them to your dry cleaner. Every single dry cleaner I’ve ever asked has gladly accepted them for reuse (they are cleaned first!) though some businesses I’ve asked over the years were clearly shocked at the question indicating how few folks seem to consider this important aspect of reducing waste. I typically recycle my hangers with a dry cleaner I don’t even do business with just because he has a drive through window which makes drop off of the pile of hangers especially easy! Metal hangers can also be recycled as scrap metal, so taking your hanger stash directly to the local recycler works fine too even if they aren’t accepted with your recycled trash. Since plastic hangers can’t be recycled at all, it is best to make the effort to return them to a dry cleaning business when you are out and about doing other errands. Little efforts can really add up over the long term! How about your home? Do you make a practice of recycling your dry cleaning hangers?